If you’re looking for something to do this Sunday afternoon, we highly suggest you come out to Dundonald Park at 3PM, where we will be performing some of our acoustic tunes as part of the second edition of the “4in1” Live in an Ottawa Park music series. It’s going to be a lovely show. I asked Ming if it would be okay for me to burn things during our set. He doesn’t think it’d be a good idea. We’re bringing along some other interesting props instead. 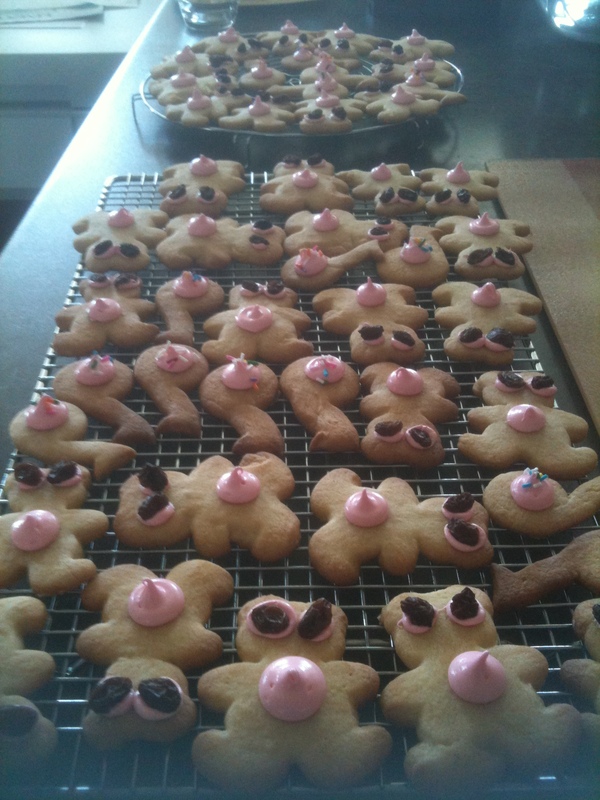 Also, I have baked these scary bear cookies for the event. You only get some if you come out. Let’s pretend that I baked them to be demented on purpose. Finally, a big thank you to everyone who came out to our show at Fall Down Gallery last night. You guys are all wonderful, and your support means so much to us. We’ve been continuing to get a lot of support all week for our new music video “Asian Fetishist”. In particular, we want to thank Katie from Apartment613 for her great article about the music video, and Alan Neal for playing our song and promoting our weekend gigs on CBC Radio 1’s All In A Day. What an honour to get airtime from our favourite national public broadcaster! We`re excited for our show tonight at Fall Down Gallery (288 Bank Street). Doors open at 9PM and cover is only $5. We can`t wait to show you what girls in Ottawa can do! want to see us perform our new song? What a week it’s been ever since we released the music video for our new track “Asian Fetishist”! We’ve been getting radio love from the CHUO FM feminist radio show The Third Wave and CKCU FM radio show WildWorks – thanks Julie and Lenny! Ming Wu of PhotogMusic also gave a little write-up about the music video. Don’t forget about our TWO shows this upcoming weekend, where you can catch two different versions of our new song Asian Fetishist. First, on Saturday, May 19, we’ll be playing at Fall Down Gallery (288 Bank Street), where we’ll be headlining! Doors open at 9PM, and cover is only $5. Check out the facebook event here. Then, on Sunday, May 20, we’ll be playing a special acoustic matinee show at Dundonald Park as part of the “4in1 Live in an Ottawa Park” series. This event is free, family-friendly, and starts at 3PM. Check out the Facebook event here. Also, check out this Ottawa XPress article about our upcoming show. And for those of you who haven’t seen the video yet, you can see the whole thing here. Ottawa-based girl band Scary Bear Soundtrack released the music video for their new single “Asian Fetishist” on Monday, as part of Asian Heritage Month. The music video was produced by band members and sisters Gloria Guns and Esther Song. Esther created colourful paper dolls which were filmed in stop motion by Gloria in their Ottawa home. The Scary Bear Soundtrack song pokes fun at subtle racism against Asian-Canadians, composing a list of odd stereotypical pick up lines often used on Asian-Canadian women. Asian Fetishist was recorded in Gloria’s bedroom while she was working on human rights issues in Windhoek, Namibia. “Race issues were especially prevalent in post-apartheidNamibia,” Gloria notes, “and so I spent a lot of time thinking about identity, both as a Canadian and a woman of Korean descent.” The song was recorded using a guitar that Gloria had bought from a Namibian pawn shop, a melodica, and a toy keyboard purchased from the local dollar store – all of which were stolen soon after the recording. Luckily, the recording was saved.